Hellooooo! You may have noticed that I've been AWOL from the blog for a bit - this is partly because I've been really busy, and also partly because I've just not been in the mood for blogging really. I didn't see any point in forcing myself to blog when I just wasn't feeling it, as it's supposed to be a hobby so if I start making myself write posts when I can't really be bothered then it's going to lose it's fun appeal. I've started to miss it though so it seems like a good time to get back into it, plus I've got loads of ideas for posts that I want to write so I thought I should get a move on! To ease myself back in, and to give you all a little update on what's been happening I'm going to start off with a photo-heavy summary post. Later this week I should hopefully have posts up on party dress shopping, a small autumn/winter Primark haul, a review of the Origins Zero Oil range I've been trying recently, and a post on how to get rid of cold sores (exciting stuff!). 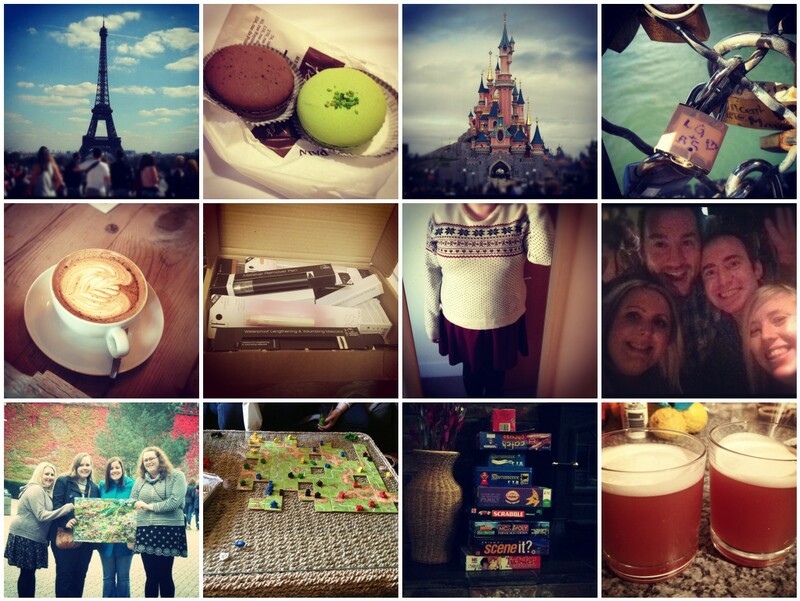 1) to 4) B and I went on a romantic break to Paris - you'll find more pics here if you fancy a nosey. 5) I had a catch up with Colin at our friend David's new coffee shop - Brew Lab. If you live in Edinburgh I highly recommend you pop along, my mocha was divine! 6) I took advantage of the 50% off when you spend £50 offer at ELF and got myself a box of treats - will need to write up a review post at some point, although I'll be honest - most of the stuff is actually still in the box under my bed unopened yet! 7) I've been getting in the mood for winter, updating my wardrobe with some new cosy jumpers including this very Christmassy one from Primark. 9) to 12) I went on a girly weekend to Alton Towers - we rented a cottage and had an awesome time playing lots of board games* and drinking lots of cocktails! *How rude does this look by the way.....the cottage had the Catchphrase game in a cupboard so we were playing it and this one came up....filth! looks like you've been busy lately!